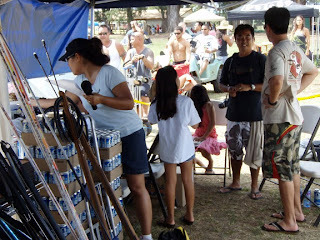 Mark your calendars divers for the 2011 Gene Higa Memorial Tournament coming up May 21 at Puuiki Pavillion in Wailua. 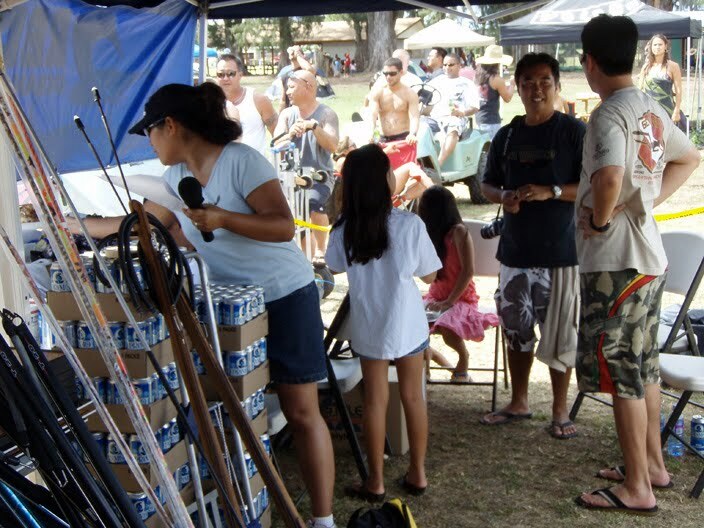 Last year was a great event and good times was had by over 100 divers. 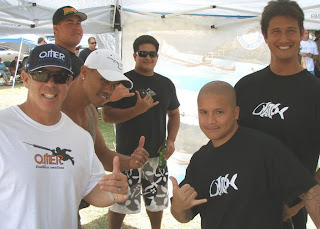 Some of the boys giving the "shaka" as they were hanging out. There are great sponsors like primo beer, outback steakhouse, hatch custom spearguns, hammerhead spearguns, omer, and more. Clifford Cheng and Marc Inouye always hard at work behind the scenes. 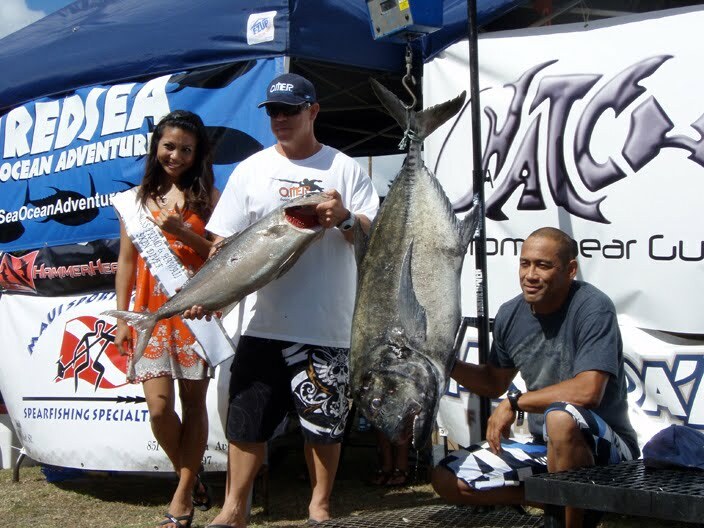 Calvin Lai Jr. and Hanalei took the event with this huge ulua they found in a cave. This is Hanalei's back yard so its no surprise to have him bring home the big one! This past year reigning Iron Chef Kimi Werner took on the challenger, Nico Chaize from Nico's at Pier 38. It was a showdown to remember and we got it all on the next episode of Hawaii Skin Diver premiering May 3rd 8:30 pm on OC16. Check it out! One of greatest things we can do for our keiki is teach them what we know. 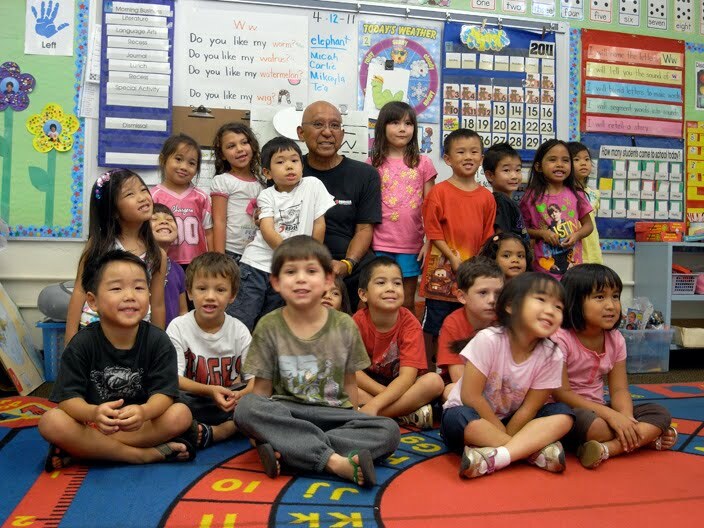 We had the opportunity to assist Gyotaku Artist "Crow" Nakamoto at Kaneohe Elementary School demonstrate how to do gyotaku to kindergarden kids. They were so happy and excited to paint fish. One kid asked if she could eat the fish, another told me he goes diving with his dad already, another said he watches our show, Hawaii Skin Diver all the time. They were so proud and printed then painted their fish with their water colors. This girl Kiyomi's expression says it all. I bet it will be framed on her wall forever. 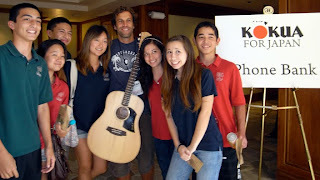 A big mahalo for Crow and his crew for teaching the kids at Kaneohe Elementary how to do gyotaku. Now is the time to pass it on! after about 30 minutes this mahi came bolting in for my flashers. I quickly lined up as the mahi darted left and right trying to get a shot. I had a hard time getting the shot I wanted so fired and it went high but held on by the skin of the fish. I motioned to Kekoa to back me up as the fish headed up to the surface. Kekoa nailed it with his 100 cm Omer and we called it a day. Thanks guys for joining me on another Red Sea Ocean Adventure. Next trip is La Paz, Mexico so get your gear together and climb on board that trip and hopefully you will get a chance for some pelagics, marlin, and maybe a rooster fish too! June 12-18th. Email me for any questions. 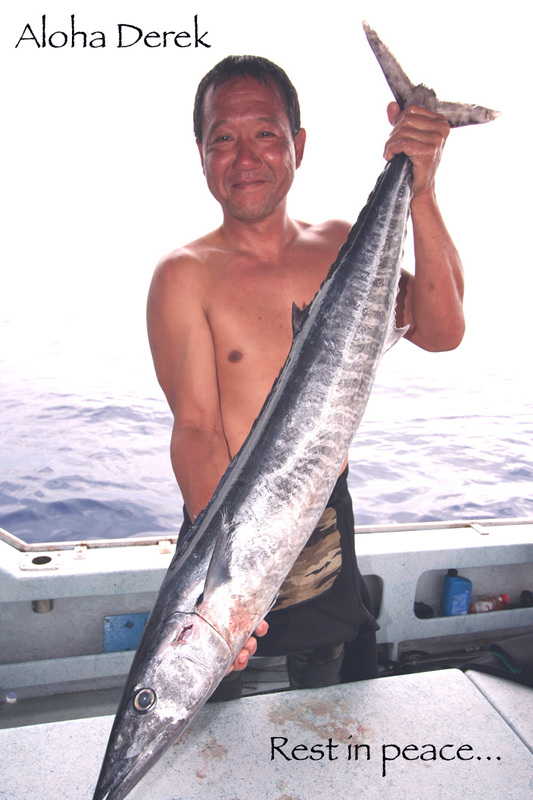 Just heard out our friend, Derek Hara from the big island passed away diving. http://www.staradvertiser.com/news/breaking/119902179.html Seem like just yesterday we were over there filming with him shooting his first ono and eating all the good grinds his wife provided our group. His infectious smile and cracking jokes all the time, and hospitable attitude toward others was a few of many things that made him so special. May God's peace provide his family strength during this most difficult time. Aloha Derek, you will be greatly missed. Merlinda in the house..represent! Mahalo for donating everyone! More opportunities to support Japan coming, stay tuned! 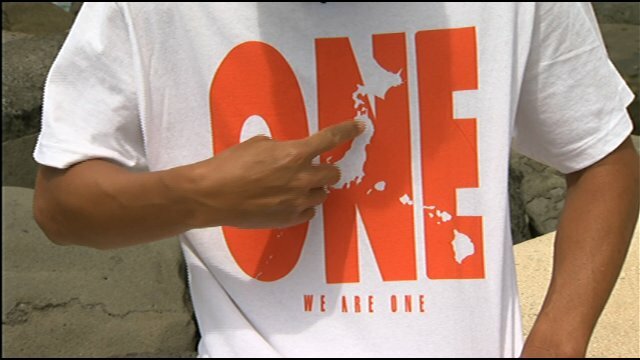 Today was one month since the Japan Tsunami happened and it was all about "Kokua for Japan". 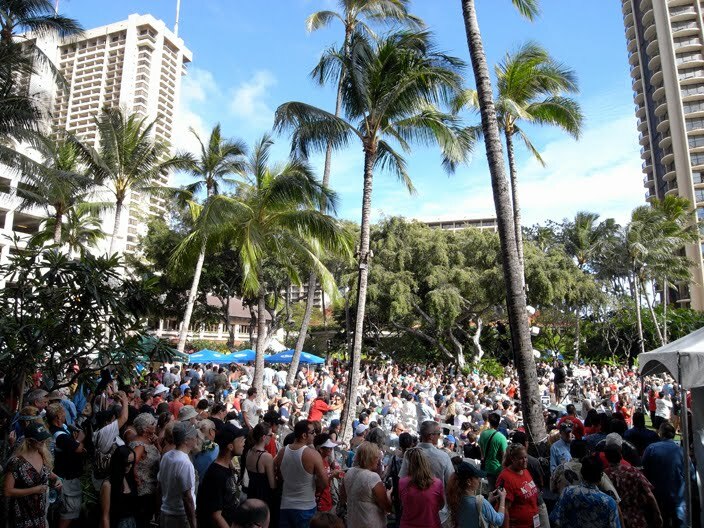 The Hilton Hawaiian was jam packed with over 4,000+ people here to support the event. I was there as a paparrazi with my minature dive camera/video trying to get da shot! 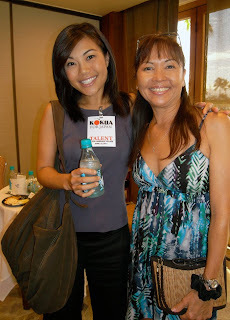 Merlinda Garma was in the house representing our Hawaii Skin Divers answering calls. She said people were donating left and right as the phones were going off the hook. Got to see all the newscasters like Jody Leong (left), Paul Drews (middle), and Brooks Baehr (right) there answering calls. Great to see our local media out there. Cat got a photo with Stephanie Lum and hopefully we will get her on a future episode of HSDTV. Congrats to you and Ryan! 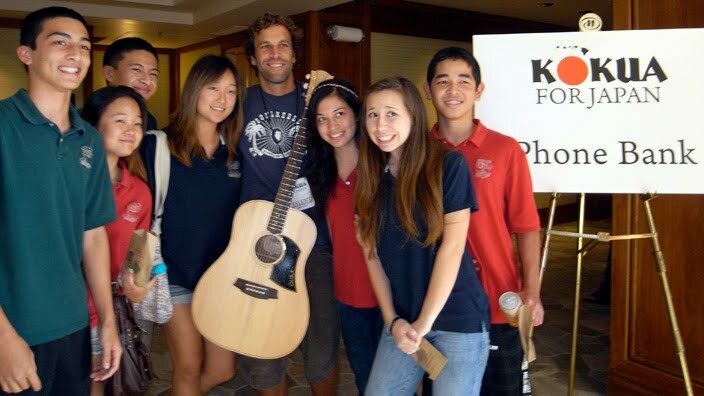 Even Jack Johnson was there to kokua for Japan. 1.6 million dollars was raised today which exceeded their goal of $1 per person in Hawaii. Lets keep praying and supporting Japan! As the world watches Japan's disaster from afar Kirby decides to go! Kirby has been traveling with me all over and everytime we surf or dive together we end up talking about travel. We share the vision of making peoples dreams come true and went the tsunami hit while we were filming in Palau, it hit him hard. So hard he decided to go and do something. We are planning another trip to go help the people in Japan later this year but it was on his heart to go now! So with his chief designer Naoka they came up with this tshirt design, raised money and went! Now he is in Sendai and we are all praying for him and wishing their team Gods speed as they go share the aloha and let them know we are "ONE". I know this is one of the most scariest trips ever for him ever and we look forward to a successful mission. Computer went down again so sorry no posts recently. 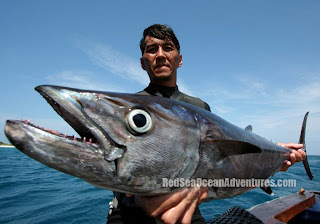 After our recent trip there has been so much surf so haven't got to dive till yesterday. Went out with my friends Kris, Kekoa, and Brent and found a little uku for dinner. Thanks Brent for the photo! This month we are featuring last years Mexican Shootout so tune in to OC16 or watch it online via www.oc16.tv for some fun times in La Paz Mexico. We got some pelagics and got to see giant humboldt squid caught which was interesting. Rest of the week looks like dropping swell on the north with moderate south swells so wax up and see you out there!